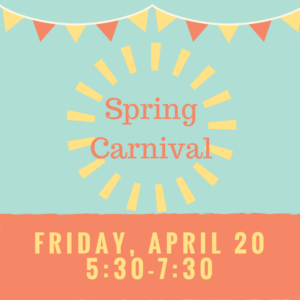 We invite you to join in the fun at the Spring Carnival on Friday, April 20th, from 5:30pm – 7:30pm. Admission is free – tickets for food and activities will be sold for $1. We will have a DJ, photo booth, petting zoo, pony rides, moon bounce and more.